KKH warrants this wood product to be free from defects in material and workmanship under normal use and service for a period of (5) years from the date of delivery. Furniture with defects will be repaired or replaced at KKH's option or, if replacement or repairs are not possible, alternate financial remuneration may be paid at KKH's option. Fine wood furniture should not be exposed to extreme heat or humid conditions, such as placing it near a heat outlet or an open window. Try to avoid direct sunlight which may cause certain finishes to fade. Every effort is made to make the finish as fade-proof as possible. 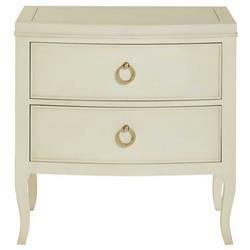 Elegantly store your bedroom items by placing a Modern Classic ivory metal inlay two-drawer nightstand at the side of your bed. The alabaster finish provides modernist neutral tones fit for many bedroom design looks, and the decorative drawers offer easy storage for your extra soft sheets and linens. The inlaid metal border sets the stage for your table lamp and tabletop decor.